The "black diamond" is losing its luster. Coal mining, which has been part of the economic and cultural fabric of southern Illinois almost as long as there has been a southern Illinois, is now causing painful change to many people in the region. They are the victims of the titantic clash between economic health and environmental quality. Their pain will intensify during the next decade with repercussions felt across the state as the struggle between "clean" air and "dirty" coal centers on Illinois, and particularly on southern Illinois. 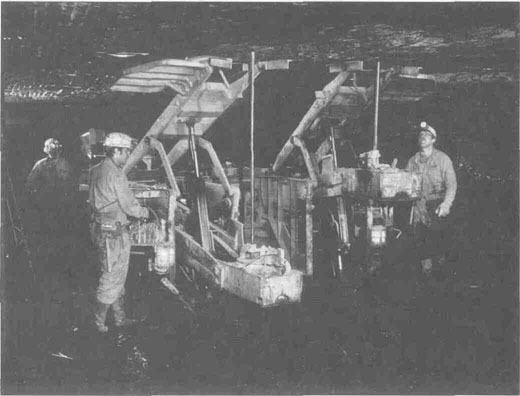 Half the coal miners in Illinois could lose their jobs in this last decade of the twentieth century as a result of the acid rain regulations in the Clean Air Act Amendments of 1990. The process has already begun in Saline County in southeastern Illinois, where Sahara Coal Company, which can trace its history to the earliest mining operations in the county, shut down, idling nearly 300 miners. Sahara lost its main customer, Electric Energy, Inc. at Joppa, Ill., which switched to lower sulfur Wyoming coal to comply with clean air mandates. Saline County may well offer a picture of the pain yet to come. Saline County in Illinois which purchase 90 percent of Illinois coal, are cancelling or renegotiating contracts with coal producers. An increasing number of mine owners are closing their doors. For the miners who have enjoyed good wages and benefits that have afforded them a comfortable life, the future looks unpromising. Hard choices, sacrifice and an almost assured drop in standard of living is the prediction, the fear and perhaps the reality, at least in the near future, for a large portion of the population in the lower third of the state. "[The Clean Air Act] is the most devastating piece of federal legislation that's hit downstate Illinois in my lifetime," says Congressman Glen Poshard (D-19, Carterville). "It's one of those issues in the federal legislature that you just can't make people understand. Coal is a dirty word." In a debate between clean air for all Americans and the probable adverse economic effects in one region, Poshard says he has a hard time convincing even other members of the Illinois delegation, particularly those from Chicago, that the economic pain experienced in southern Illinois from the new regulations will hurt the rest of the state as well. And the economic impact won't be limited to southern Illinois. A computer-generated projection of future economic trends seems to verify Poshard's forecast. The Department of Energy and Natural Resources February 1992 study projected that northeastern Illinois — Chicago and the surrounding ten counties, where there are no mines or miners — can expect to lose over 7,200 jobs by 1995 because of the decline in coal sales. These job losses are expected in secondary businesses that serve the mining industry, such as financial services, advertising, printing, public relations and professional consultation. Based on statewide statistics compiled by the state Department of Commerce and Community Affairs, total personal income is projected to decline by $508 million by 1995 and $888 million in 2000. The report also estimates that annual state tax collections will drop by as much as $49 million in 2000. Moreover, for each job lost, employer contributions to the state unemployment insurance program would decline by about $225 annually. Cumulatively, these contributions are expected to decline by roughly $4.6 million by 2000. Meanwhile, increased demand for benefits will further burden the program. Cumulative unemployment benefits paid out by the state could be as high as $148 million by the year 2000. For three generations, Sahara Coal Company has been synonomous with Saline County. Until last June. That's when Sahara closed its doors and began sealing its underground mine and restoring its strip mine to farmland. 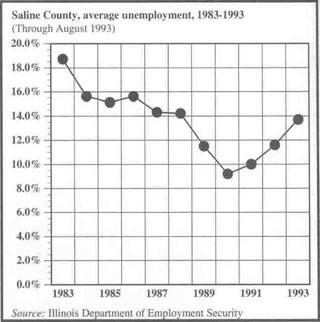 The third largest coal-producing county in Illinois, with 7.5 million tons mined in 1992, Saline County has lost one of its anchor mines. The effect has been devastating. Mike Vessell, labor market economist with the Department of Employment Security, says the lost mining jobs have sent the unemployment rate for the county to 16.6 percent for August compared to 7.3 percent for the state. Last May the rate was 12.2 percent for Saline County. Vessell predicts the rate will hit 18 percent, minimum, within the next 60 days when Peabody miners are added to the rolls. Vessell says the retail trade, particularly the "mom and pop" businesses, will be among the first to feel the effects of the drop in wages. On average, mining jobs pay more than double what other workers in Saline County make. Mayor John D. Cummins of Harrisburg fears a significant drop in sales tax revenues because "the unemployed miners will not have the disposable income they have been used to spending for such things as eating out, movies and shopping." Indeed, estimates run from $1 million to $2 million per month in lost payroll and lost revenues to businesses serving the closed mines or jobless miners. Walter K. Bean, mayor of Eldorado, echoes Cummins' apprehensions. Bean says people have been calling him worried about paying their county property taxes. He reports that county officials have considered allowing late payments, but that probably won't prevent some families from selling their houses and moving out of the community. Some families left, says Bean, after the surface mine. Equality Mining Company Mine No. 1, closed in December 1991, idling 47 employees. Moving away is considered a last resort by most of the unemployed miners, whose roots are as deep in southern Illinois as the seams of coal. Nevertheless, William H. McClusky, president of District 1 of the Progressive Mine Workers of America, the union representing the miners at Sahara Coal, says they are "scared to death." It is a shock, he says, to people who have worked hard all their lives and made good money — most, he says, averaged about $40,000 a year — to now realize they may not be able to afford to stay in their homes. "They tell me 'my house only lacks two years of being paid off, but the taxes are $2,000.' They'll end up losing it for that," says McClusky. The financial devastation reaches beyond the 300 laid-off miners, McClusky says. Another 250 retired miners and at least 1,200 family members are affected through lost medical benefits. For miners accustomed to almost 100 percent health coverage, including eyewear and dental care, the loss of insurance is almost as frightening as the loss of good wages, says McClusky. "Hillary is going to save us," McClusky says half sarcastically and half hopefully. For everyone agrees that some of the families out of work will be forced to turn to government assistance in order to survive. Yet, that choice will not come easy to many of the unemployed miners. Southern Illinois is a rough-hewn sort of place, a socially conservative region with a culture that values and encourages personal independence and self-reliance. Rep. David Phelps (D-118, Eldorado) says that determination to support one's family by whatever means necessary may cause some families to "drop through the cracks" of the state welfare system. Phelps says he's seen husbands accept any kind of odd jobs to feed their families, and wives who have never worked outside the home seek jobs. Those jobs tend to be in the service industry, the only employment available besides farming and mining, and usually are part-time, minimum wage and without benefits. Those with low-wage full-time employment are even more vulnerable. "These people are not going to be able to qualify for public aid because the wife is a clerk in the bank, a secretary or a real estate broker, and the husband is picking up odd jobs," says Phelps. "If something happens, the hospitals are going to be absorbing a lot of big bills, and that has a ripple effect of those who are paying will have to pay more." Moreover, local officials harbor the fear that a cycle of decline for support of public schools and small businesses — the heart and lifeblood of most small communities — has begun and may be irreversible in the near future. Sahara's property taxes of nearly $150,000 a year, of which about half went to the local school system, will be substantially cut as the taxes drop on the idle land. John Hill, superintendent for Harrisburg Community Unit School District 3, says the mine closings will definitely hurt the school district. "I am certainly anticipating a decline in our student enrollment, maybe five to 10 percent," says Hill. That may mean the school district will have to lay off staff in the next school year, he says. With the school district already on the State Board of Education's financial watch list. Hill says that "there's nothing good that can happen to the school district out of this." Nearly two-thirds of the unemployed Sahara miners are themselves in school, enrolled in classes at one of the local community colleges or at Southern Illinois University to train for new occupations. McClusky says he encouraged union members to enroll in classes to qualify for retraining grants set aside as part of the Clean Air legislation in 1990. But, he says, "the bad thing in this area is they can retrain you all they want. It doesn't make any difference. There's not any work.... The only jobs there are here are 20-hour a week jobs at minimum wage at Wal-Mart and McDonald's." Phelps says he thinks it unlikely that any company with upwards of 500 jobs will locate in the area any time soon. But he does envision the growth of small businesses providing 20 to 50 jobs and feels the area should strive to diversify its economy. But McClusky is skeptical. "Fifty Wal-Marts do not equal one Sahara," he says. kets. An industrial park complete with roads, sewers and electricity stands ready, but empty. Ronald Morse, director of Illinois Department of Mines and Minerals, who worked for Sahara for 22 years, served one term as mayor of Harrisburg and has served "on every economic development committee formed in the county," cites another barrier to economic growth. Morse says the area has suffered some severe labor strikes in the past and has gained a reputation — he thinks unfounded — as a hostile labor environment. The area also finds it hard to compete with Indiana, Kentucky and Tennessee, where workmen's compensation costs are lower, says Morse. Saline County Development Director Henkins says the county "is still licking its wounds" over not being chosen as the site for the state's new maximum security prison, the only immediate prospect for replacing 300 high-paying, good-benefits jobs. Henkins says the county started 20 years too late in thinking about economic development, believing the mines would always be there. Labor market economist Vessell says that attitude is prevalent throughout southern Illinois with many communities "hitching their wagon to one horse." When that horse is gone, as happened with mining in Saline and Gallatin counties or the furnace factory in Randolph County or the shoe factory and bread company in Union County, the area has an immediate economic recession that often reverberates throughout the state, Vessell says. What is happening in Saline County may be a glimpse into the future of coal mining. Even as Sahara shut down, AMAX Coal Industries, Inc. operates a mine of the same size, in the same area, producing an identical product. "Sahara's gone, and AMAX is still producing," says Mines and Minerals Director Morse. AMAX is a multinational corporation with low-sulfur coal reserves in both West Virginia and the Powder River Basin in Wyoming. Because the large mining corporations have diverse operations, says Morse, they can shift resources and can blend high-sulfur, high-Btu Midwestern coal with low-sulfur, low-Btu western coal to reach a mix that complies with federal regulations. 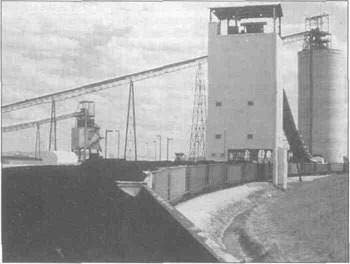 Saline County has three other coal mines operating: Big Ridge, owned by Arclar Coal Company, an independent, family-owned producer confined to the county; Brushy Creek, owned by Western Fuels Corporation; and Galatia Mine, owned and operated by Kerr-McGee Corporation, a multinational, diverse-fuel company based in Oklahoma City, Okla. Both Morse and Taylor Pensoneau, vice president of the Illinois Coal Association, agree that economic forces point to a restructuring of the coal industry that could result in small independent companies going out of business, threatening two more mines and another 370 mining jobs in Saline County. The jobs at the Galatia mine seem to be secure, at least through the first phase of the Clean Air Act restrictions limiting sulfur dioxide emissions. According to the Illinois Department of Energy and Natural Resources, less than 10 percent of Illinois coal reserves can meet the 1995 standards. Galatia Mine in Saline County is one of the four mines in Illinois that currently mine low-sulfur coal. But, says Kirn Underwood, director of the state office of coal development and marketing, "There's not an ounce of Illinois coal that can meet the stricter Phase II standards" that will take effect on January 1, 2000. Morse says that all of Wyoming's Powder River Basin coal, Illinois' chief competition, has sulfur levels below Phase II standards. "However," says Morse, "it takes three trainloads of western coal to reach the heat level of one trainload of Illinois coal." On the other hand, Morse says, western coal is found in 60-foot seams just 6 feet underground, whereas Illinois coal is in a 6-foot seam 600 feet underground. Kerr-McGee officials believe they will be able to weather effects of the federal regulations until either the market for Illinois coal improves or technology reaches the point of making the problem of sulfur dioxide emissions moot. New markets for medium- and high-sulfur coals are expected to develop in the next twenty years. State officials expect domestic markets to develop with the installation of sulfur dioxide control technologies at existing power plants and the construction of new plants incorporating technology to burn high-sulfur coal. As worldwide energy needs increase, export markets are expected to grow. In addition, as a leader in clean coal technology, Illinois expects growth in energy-related businesses, which should bring new engineering and manufacturing jobs to Illinois.